This add-on allows you to create user rights groups and then assign users to these groups. You can grant page-specific access to anything in the menu. Users will inherit the access rights of their group, but can also be given additional pages or have some taken away. This tool allows you to pull things off of any user's menu to narrow their interface down to just the modules that they need inside the system. (1) Go to Admin->Admin Setup->User Rights Groups. (2) Create a new group by entering the Group Name. If you have multiple companies and want these user rights to apply to all of them, check the All Companies box. 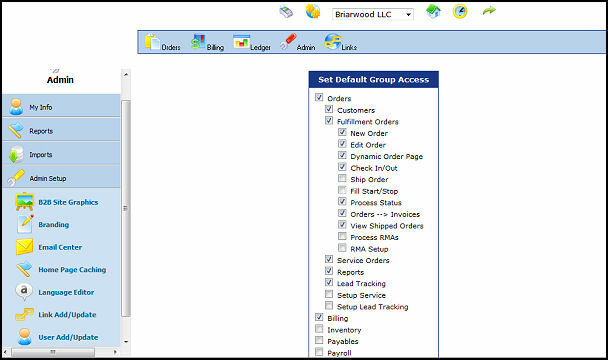 (3) In the Set Default Group Access section, check the items you want your users to have access to. Clicking on the section name expands the section so you can select exactly which menu options are available. (4) To assign the group to a user go to Admin->Admin Setup->User Add/Update and select the group name from the dropdown.